Russia regards as top priority the maintenance of its strategic nuclear capacity, which represents the base of its policy of deterrence. From this point of view, and in advance of the need for replacing the obsolete hardware or not in conformity with the START-II agreements (which authorize single-warhead land-based missiles, while permitting multiple-warhead sea-based missiles) a process of modernization of hardware has been authorized. This envisages the development of missile SS-27, successor of the SS-25, and the development of the new SS-N-28 embarked on submarines, and the construction of a fourth generation of strategic missile submarines. Russia still maintains a large force of nuclear-powered ballistic missile submarines equipped with intercontinental range missiles. Although the number of Russian SSBNs is expected to drop considerably over the next few years, Russia planned to modernize its force with the addition of the new SS-NX-28 and new Borei Class ballistic missile submarines. The new Grom SS-N-28 was designed to provide improved accuracy compared to the previous SS-N-20, but is otherwise apparently a straightforward development of this system. The SS-NX-28, unlike previous Russian SLBMs, is the first to be totally developed and manufactured within Russia's borders by the Makeyev Machine-Building Design Bureau. 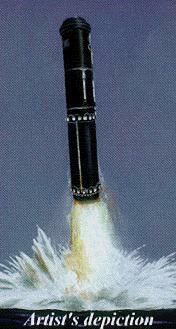 The test launch of a prototype SS-NX-28 (RSM-52V) SLBM on 19 November 1998 resulted in a catastrophic failure of the SLBM's booster. The missile exploded roughly 200 meters after take-off from its ground based launch station. Having had failed its first three test firings, and the SS-N-28 project was abandoned. As of early 1999 it appeared that construction had ceased on the first unit of the Borei-class, pending a redesign of the ship to accomodate a different missile from the originally intended SS-N-28. The Typhoon submarines were initially intended to be retrofitted with the SS-N-28. The lead unit of this class, the TK-208, had been in overhaul since 1992 with the intent of receiving these modifications, but it now appears that it will not return to service. The Typhoon class submarines are slated to be withdrawn from service within a few years, and it is unlikely that other units of the class would be modified to accomodate new missiles. In January 2000 Rear-Admiral Vladimir Makeev, the head of the Northern Fleet's rocket test site at Nenoksa, Arkhangelsk County, stated that Typhoon submarines would be used to test the new Bark-class strategic missiles. Makeev also stated that Bark-class missiles were to be installed on the forth generation Borey-class submarines. The creation of D-19UTH missile complex designed for the new nuclear strategic submarines of the Borei-class has been undertaken at GRTs KB named after V. P. Makeev. The D-19UTH launch complex is to replace the D-9 launch complex with RSM-52 ballistic missiles. The new complex will be equipped with a solid-fuel ballistic missile of greater reliability and longer range, capable of being fired from the surface and under-water positions.